The wave generator is equipped with online Active Reflection Compensation. This means that waves propagating towards the wave board are measured and that the wave board compensates for these reflected waves. In this way these undesired waves do not re-reflect towards the construction and do not disturb the measurements. Also wave board control for random second-order waves is operational to compensate for spurious waves. 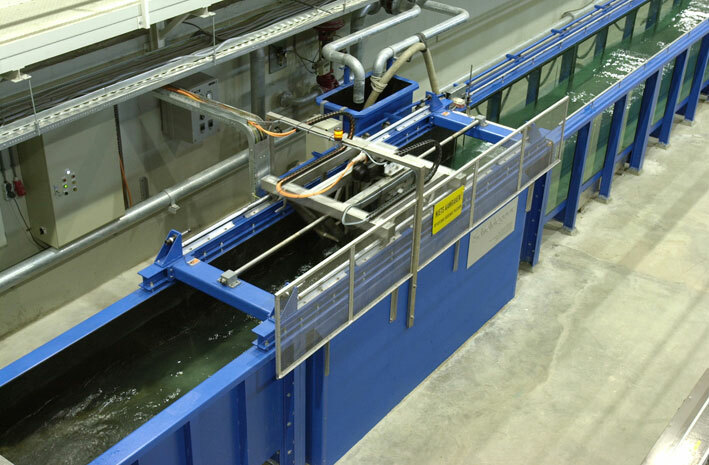 The Schelde flume is equipped with Deltares/Delft Hydraulics' second-order wave computation software Delft-AUKE/generate which has been developed by Deltares/Delft Hydraulics. This means that the second order effects of the first higher and first lower harmonics of the wave field are taken into account in the wave board motion. It is designed to suppress spurious waves in order to generate a true-to-nature wave field in the basin with little laboratory side effects. The software is capable of generating regular waves as well as irregular waves according to well-known and user-defined spectral distributions. Besides the reduction of the generation of spurious waves, it is very important to suppress the re-reflection of waves at the wave maker. To this end, the wave board is equipped with three wave gauges, which measure the wave height at the paddle. The wave gauge signals are used as input for the online Active Reflection Compensation algorithm, which identifies any reflected waves and instantaneously compensates the wave board motion to absorb these waves. Our experience in physical model studies of harbour structures is considerable. We are involved in studies on a diversity of coastal and offshore structures. In all of those studies aspects of armour stability, wave impact loading and the determination of the relevant hydraulic conditions for design purposes was of primary interest. It is possible to construct all kind of foreshore bathymetries in our Schelde flume, both fixed bed and mobile bed foreshores to ensure the wave behaviour in the model will be the same as in prototype.